Unrepaid loans and rising levels of insecurity in Venezuela may mean that the country cannot receive additional significant loans or investment from China in the near future, The Wall Street Journal reported Sept. 11. How important a lifeline is Chinese financing to Venezuela, and what will happen to Venezuela if China holds off on additional financing to the country? What other financing options exist for Venezuela, whose economy is expected to contract 10 percent this year, according to the International Monetary Fund? Would China maintain its interest in providing financing to Venezuela’s government if President Nicolás Maduro is forced from power and the opposition takes control of the presidency? The following commentary was originally published in the Inter-American Dialogue’s Latin America Advisor on September 26, 2016. For almost a decade now, China has been Venezuela’s most important foreign financial partner. Even before the end of the commodity boom and the crushing drop in oil prices, Venezuela’s Chavista government had come to rely on regularly renewed tranches of Chinese loans for oil. But as the price of oil and PDVSA’s own productivity have plummeted, it has become increasingly burdensome for Venezuela to service these loans. The Sept. 11 Wall Street Journal article said little we haven’t known for quite some time: that Chinese foreign policy and bank officials are deeply concerned about the situation in Venezuela and are reticent to dig themselves an even deeper financial hole in a country descending ever further into economic and political chaos. Without further Chinese financing, Venezuela, and in particular PDVSA, will be under even greater budgetary strain. However, there is little indication that Maduro and his government will veer from their self-destructive policies. But even if a new leader or government in Venezuela comes in and begins to address the country’s many economic and political dysfunctions, it makes little sense for China to continue with its government-to-government financing of long-term oil purchases. This model did little, if anything, to guarantee China’s own energy security, nor did it benefit the people of Venezuela. Instead, the China-Venezuela deals and similar Chinese commodities-for-loans arrangements with countries in the rest of South America and Africa have saddled many of the debtor nations with unsustainable sovereign loan burdens and left promises of ‘South-South’ development unfulfilled. China is indeed unlikely to invest much more in Venezuela in the foreseeable future, even though Venezuela has requested more support. Low crude prices are making China’s preferred model of oil-backed lending less viable. Chinese frustration with Nicolás Maduro’s economic management has also risen in recent years. It is unclear how much of the $60 billion in finance disbursed to Venezuela by the China Development Bank and the China Export-Import Bank has been repaid. But by all accounts, Venezuela still owes China a considerable amount, to be paid in oil. There are signs of some openness on the part of China to the possibility of restructuring existing loans in the event of a possible default. Engagement in recent years has been aimed in part at slowing Venezuela’s downward spiral. Beijing took some measures in 2014 to help Venezuela avoid overpayment on one tranche of the China-Venezuela Joint Fund. A $4 billion loan from China to Venezuela was also used that year to augment the latter’s foreign exchange reserves. More recently, there was talk of allowing Venezuela to make principal-only payments to China. Whether Venezuela defaults on its debt or not, we will very likely see continued Chinese interest in the South American nation. China remains committed to Venezuela for the very reasons it engaged the country in the first place. Many in China’s fragmented energy bureaucracy still consider the oil-rich country to be a critical partner. The primary concern now in Beijing is whether a post-Maduro government will be friendly to China. Efforts to meet with the opposition have evidently produced little clarity on this matter. Venezuela’s rising levels of insecurity and unrepaid loans are making economic cooperation between the two countries more difficult. The situation will make it hard for China to provide additional loans to Venezuela, because Chinese foreign loans are increasingly market-oriented, and the country needs to control its risk. For more than 10 years, China has been an important source of financing for Venezuela. If China stops delivering additional loans, Venezuela’s situation may become even worse, as Venezuela does not have many financing options in the international market. Hence, Venezuela would have to rely mainly on self-dependence, such as through the sale of gold reserves and foreign assets, and through the acquisition of financing loans from local organizations. For example, in July, the Latin American Reserve Fund agreed to loan Venezuela nearly $500 million. If a power shift occurs in Venezuela and Maduro is forced to step down, the relations between China and Venezuela will not fundamentally change, as the countries’ comprehensive strategic partnership is not between China and the ruling PSUV party. Therefore, even if the opposition party comes to power, China would still maintain its loans to Venezuela in accordance with its own assessment of risks and benefits, because the cooperation between China and Venezuela is based on the balanced evaluation of their respective national interests, and both seek a win-win situation. 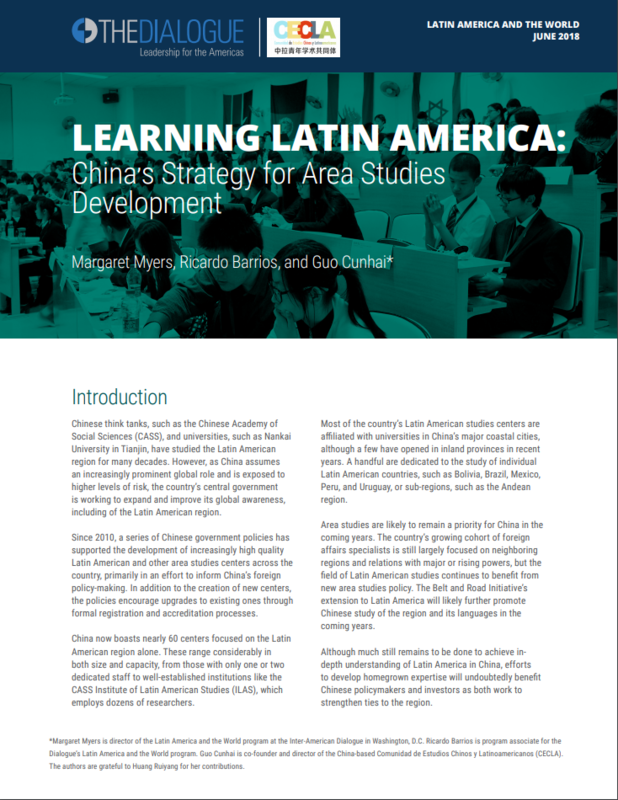 Next Next post: Is China Filling a Void Left by the U.S. in Latin America?